For several years I have been using a battery powered LED on my travel B&L scope [circa 1935] for visual and photographic plankton study. This has worked so well I decided to adapt it to my LOMO for home use without removing the existing light system. 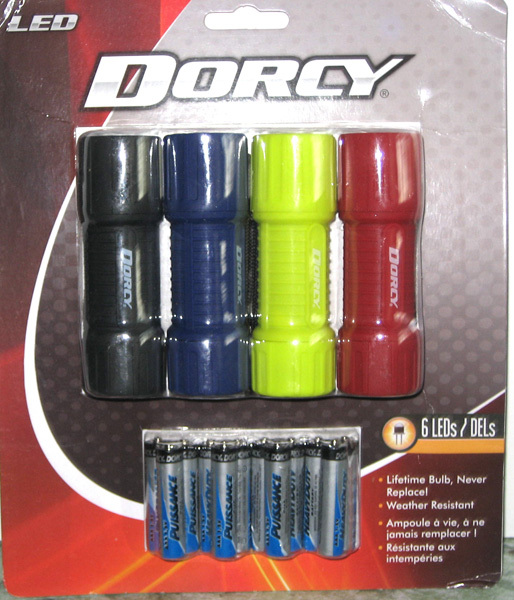 The availability of inexpensive LED flashlights [about $2 including batteries!] makes this conversion simple. The head containing the 6 LEDs is unscrewed, about 3/8th of an inch is sawed off from the bottom to provide more clearance from the condenser as the head will sit on the existing base light. 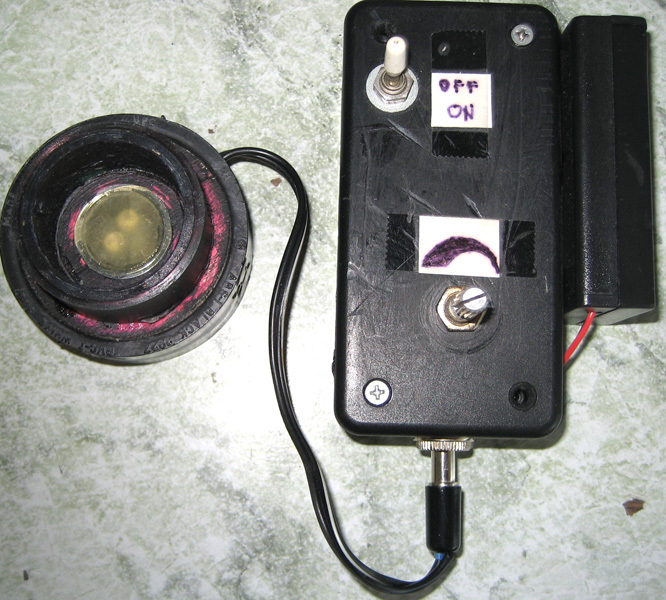 A small hole is drilled into the base to accept the wires, + is soldered to the central spring, - to the metal ring surrounding the center connection. I leave about 6-7 inches of slack before adding the connector for the power supply. 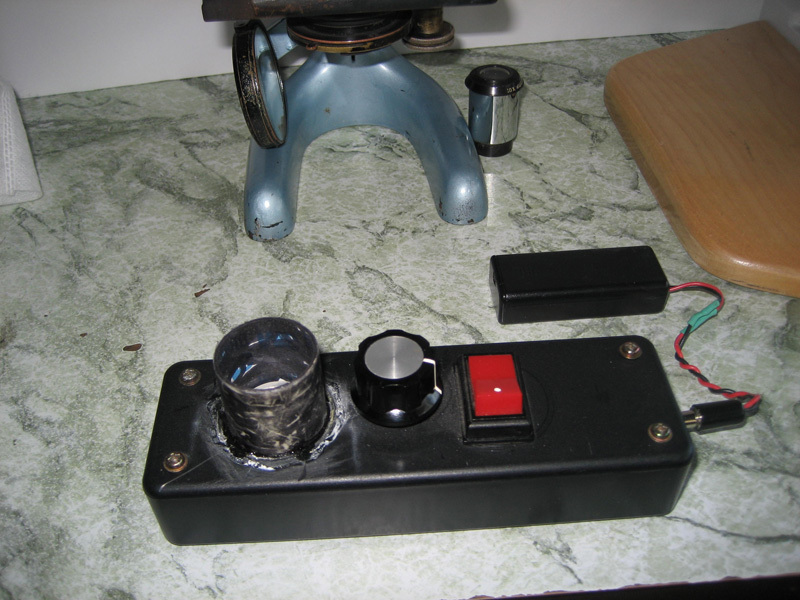 Next I used a small slide box to accept the  AAA battery case, switch, rheostat and female connector. The 3 AAA batteries which come in their own case I set aside as emergency backup. 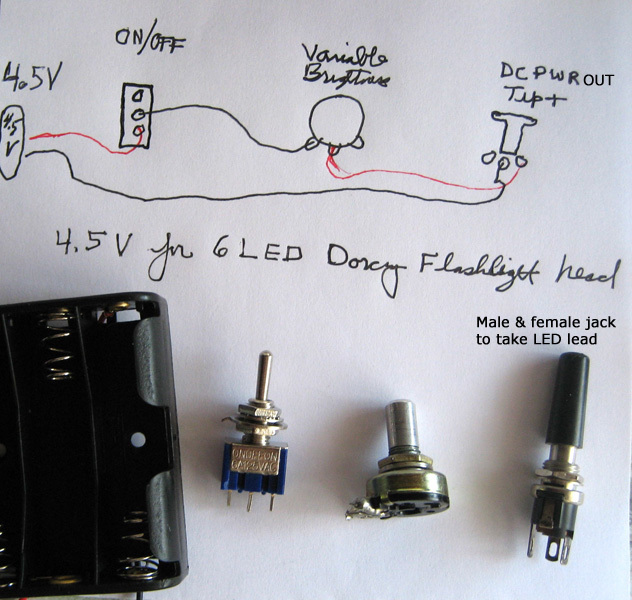 The photo shows the simple circuit along with the components used. One word about the rheostat … I bought these years ago and there is no data on them. But the response is fairly linear … the light goes from barely on to full brightness. A WORD OF CAUTION—DO NOT USE MAXIMUM BRIGHTNESS FOR VISUAL WORK!!! THERE IS CONSIDERABLE EVIDENCE THAT PERMANENT EYE DAMAGE CAN OCCUR!!! The good news is that shutter speeds are higher. My DSLR has two features that facilitate taking photos. One is live view, the other is an articulated screen. This means I can scan a slide and focus while sitting comfortably. At eye level to the camera screen I can change light intensity, refocus or take a photo with the cable release without changing position—my back and neck are much happier with this system. 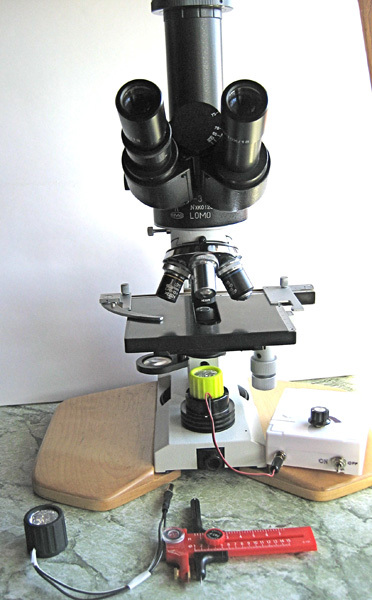 The following photos show the LED mods on both scopes plus the circuit. Source: flashlights and slide case, Amazon.com [currently October 2017] a pack of 4 flashlights with batteries is about $8 US. Source of new 6 bulb LEDs # Amazon.com. Older LED unit with B&L field scope in use for the past 8 years. Left: LOMO with LED on top of existing lamp housing with control. Right: Older unit in place with a 3 bulb LED.